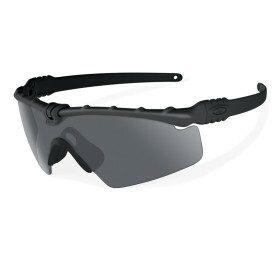 Oakley SI Ballistic M-Frame 3.0 (Blk/Grey) » Protective Solutions, Inc.
Oakley has spent decades engineering combat-ready equipment for the U.S. Armed Forces, and the SI BALLISTIC M-FRAME® 3.0 brings the future of protective eyewear to today’s battlefield and beyond. Oakley's icon is synonymous with precision optical engineering and unrivaled innovation, and this design shows why. An entirely new thin stem technology optimizes durability while enabling compatibility with over-ear hearing protection and communication systems. Clear, unobstructed vision is maintained by a advanced anti-fog coating of all lenses. Offering the ultimate in convenience, compatibility, clarity and comfort, this protective optical system can be paired with three optional interchangeable lenses, and all are optimized with the visual fidelity of High Definition Optics®. Oakley’s patented optical technologies maintain clarity at all angles of vision, not just straight ahead.